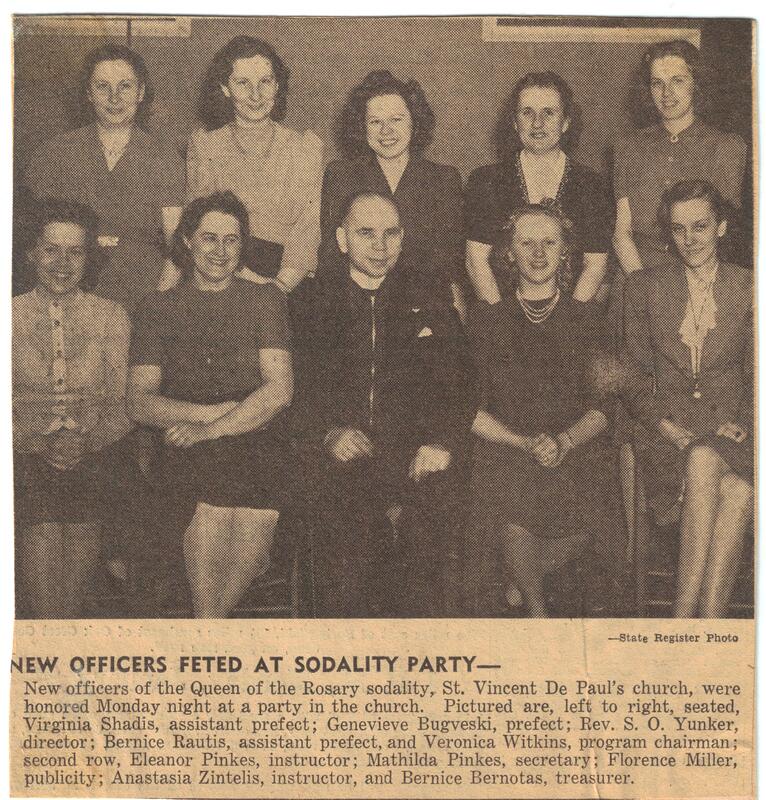 This photo pictures the committee behind the May 27, 1956 Golden Jubilee celebrations of St. Vincent de Paul Lithuanian Catholic parish, which was organized in 1906. The church was built at 8th and Enos streets in 1908 and held its last function Dec. 31, 1971, per order of the Diocese of Springfield. Others on the jubilee committee not pictured here: Mrs. Peter Kurila, Mrs. John Thomas, Mrs. Sam Lapinkski, Jr., Mrs. John Tisckos, Charles Grigas, Charles Foster, George Wisnosky, Jr., Stanley Chernis, Mary (Chernis) Urbanckas, Mrs. Alfred Urbanckas and Charles G. Tisckos. Members of the renowned church choir sing at the retirement party for long-time pastor the Rev. S.O. 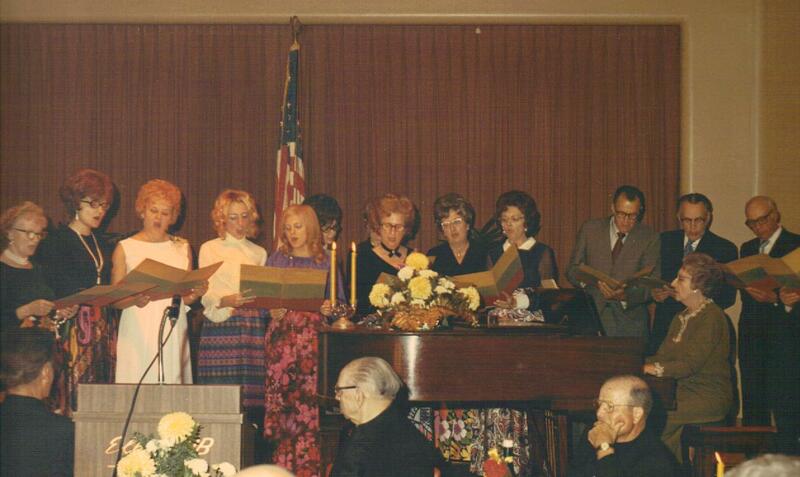 Yunker at the Springfield Elks Club Nov. 14, 1971. 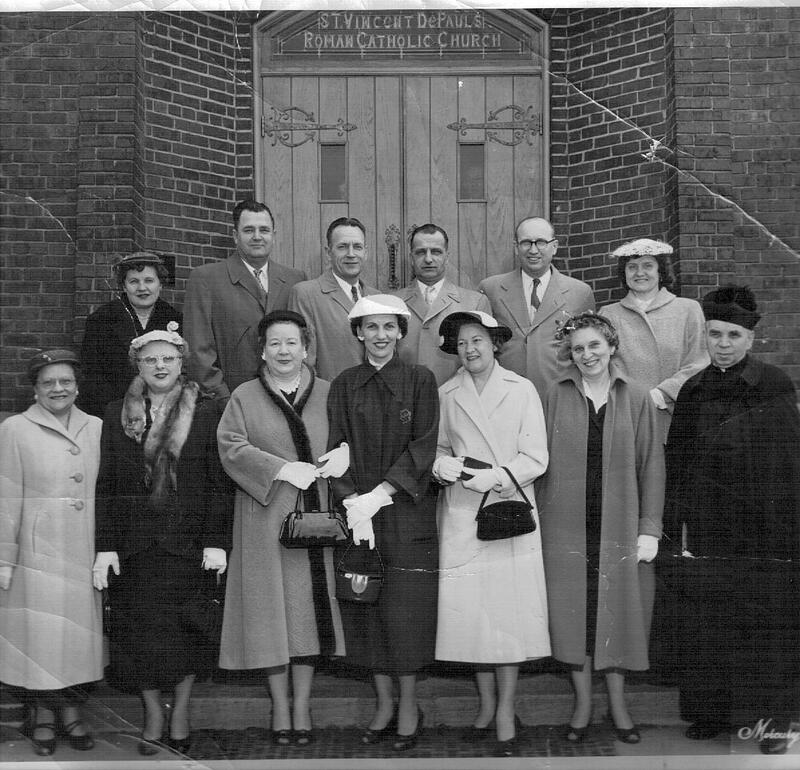 Left to right: unidentified person, Mary Ann Foster, Ann (Pazametsky) Traeger, unidentified person, Mary Ann Rackauskas, Bernice Kurila, Catherine (Gillette) Cooper, unidentified woman, Peter Urbanckas, Alfred Urbanckas, Charlie Foster, Walter Rodutskey (off right edge of the photo), Anne (Mosteika) Foster playing the piano. THE CHARTER 29 (I have suggested alternate surname spellings that other family members in Springfield might have used, or be using today). In 1956 as St. Vincent de Paul’s celebrated its Golden Jubilee, 29 of the charter members of the parish from 1918 were still members. Honored at the Jubilee banquet were: Andrius Blazis, Adomas Buckus, Petras Burcikas, Jonas Daniusis, Kazimieras Gestautas (Gestaut), Stasys Janarauskas, Antanas Jogminas, Julius Jonikis, Baltras Karcauskis, Antanas Marchulonis, Juozas Marchulonis, Juozas Meizelis, Juozas Mikalauskis (McCluskey or McCaskey), Sivestris Milleris ( Sylvester Miller), Antanas Mosteika, Juozas Rimkus, Povilus and Vincas Shedis (Shadis? ), Juozas Shimanskis, Petras Shimkus, Juozas Stasukynas (Stasukinas), Pranas Shuris, Vincas Tamosaitis, Jonas Tiskus (John Tisckos), Motejus Tribicus, Petras Urba, Jurgis Visnauskis (Visneski? ), and Pius Zemaitis. Top photo, from left: George and Helen Rackauskas and Ann Urbanckas. 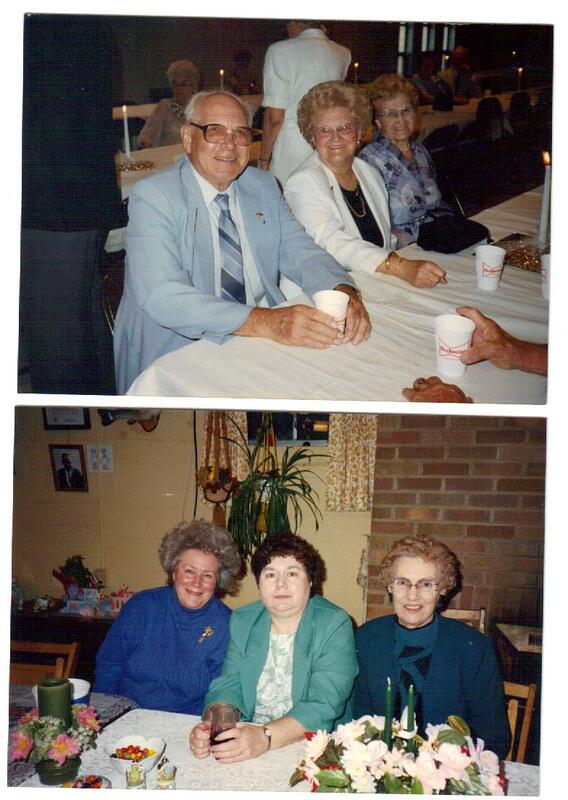 Bottom photo from left: Pat (Urbanckas) Mathews, Georgeann Wisnosky, Julia Wisnosky. I see my grandfather, Juozas (Joseph) Mikalauskis (McCluskey) is listed as a charter member of the church. I remember going to mass with him when I was very young. Thank you to everyone involved in putting all this info. together.